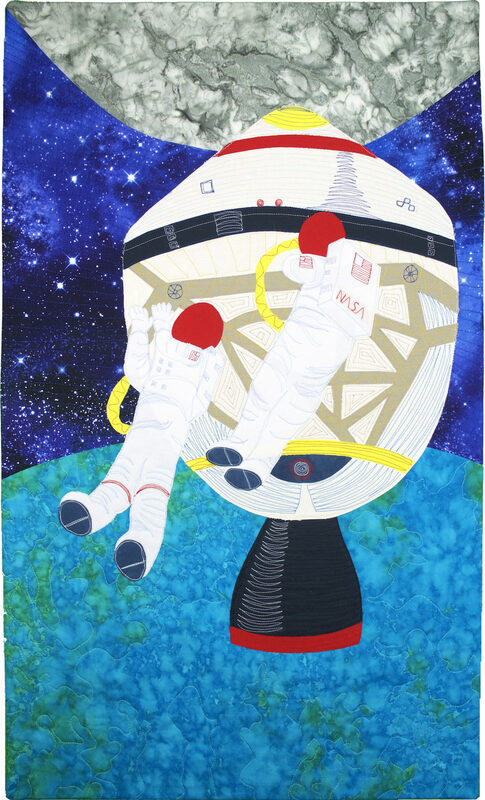 My piece began with a picture sent to me by my cousin of his space walk outside the capsule of his Columbia mission. I knew very little about specific missions prior to this. I only knew my family, like many others watched the famous moon walk of Buzz Aldrin and Neil Armstrong with awe. When my cousin actually became an astronaut in 1980 I was in awe again. He joined the NASA crew and experienced 3 flights and 523 hours in space. I struggled with this piece in that I had to change the capsule to the lunar module of the Apollo missions. I was excited just to depict this special walk. I was in awe of the view of the moon and earth. I included this in really cool tools chapter as the module had to be the coolest tool of all. It was free hand drawn inspired by my photo. It will be given to my cousin David Leestma to honor his dedication and inspiration and bravery. Raw edge appliqué and free motion quilted of my own drawing based on a photo given to me by David. Hand dyed and commercial fabrics.